Brecken was croupy last week, and when he woke up full of Grinch on Sunday I knew it wouldn't go well for us to try to leave him to his Sunday School class. I took him into "big church" and was able to actually HOLD him almost the entire time. If you know Brecken, you know this is a feat of gigantic proportions. 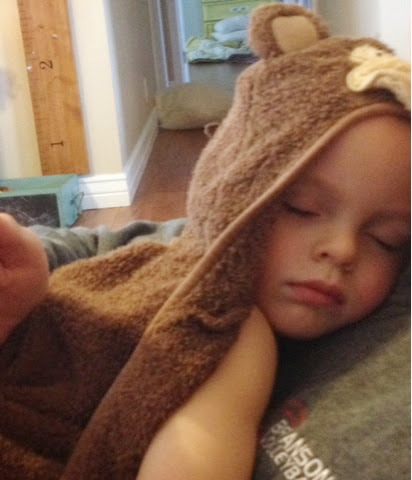 He is a busy-body with a mind of his own, so I thoroughly enjoyed the extra snuggles. And I got to sing over him. I'm not really a "singing" mom who sings over her child at night. I might have done it a little when they were babies, but--if I'm honest--I really didn't ever have much time for that when they were small. It stinks, but it is what it is. My voice stinks, too, so the cracks and flat notes kind of take the charm right out of the moment. And I rejoiced in the moments of snuggles and singing. Then the words of Zephaniah 3:17 jumped out at me. I have loved this verse for a while now, ever since one of my friends pointed out its awesomeness at an event a year ago. Since then it has, thankfully, been etched into my mind from our Seeds CDs. I find it crazy-awesome that God, Creator of our universe, rejoices over each one of His children with singing! As a mother and father rejoice over their kids with singing and swaying and whispering and kissing, and as they quiet their baby's sadness or frightened tears with their love and presence, so does God for His children. I relished the moments of rejoicing over Brecken with singing, and I was grateful for yet another picture of God's love for me, even when I feel unloveable, sick, tired, and weary. He is still rejoicing, singing over me, and quieting my ever-questioning, -worrying, -anxious heart. Not only that, but he is "in my midst" and He, The Mighty One, promises to save. Furthermore, I believe God has placed someone in C's life in DRC to sing over her while we wait to do so ourselves. Although I wish it were me, I am thankful for that someone, and I can't wait to thank her when I go visit. Being a Mom has taught me so much, and I am thankful for the lessons. We love our children no matter what. We rejoice over them and dry their tears and calm their anxious hearts. We carry them when they're tired and we take joy in their joy. Being a Mom has taught me so much, and I'm thankful for the lessons.